Today we are celebrating Respect-for-the-Aged Day (敬老の日, Keirō no hi), which is a Japanese national holiday to honor elderly citizens. It used to be held on September 15, but now it's held on the third Monday of September so that we can make a long weekend of it (hopefully to use for entertaining our elderly parents and relatives). Yesterday I was an observer at an event where celebratory confections were being handed out to everyone over seventy. One of these senior citizens, a good friend of mine, pulled a fancy box out of her handbag and asked me if I would like to have it. 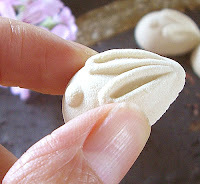 When she opened it for me, it turned out to be a rakugan confection in the shape of the face of a smiling old woman. My friend was daunted by the size of the thing and didn't care to eat it. 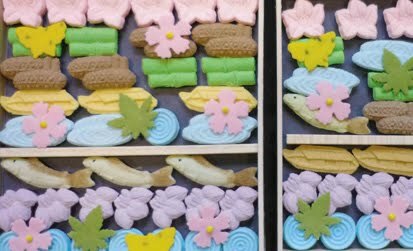 Rakugan is a confection made from a dough of sugar (or sweet syrup) and starchy powder (such as rice powder or potato starch). 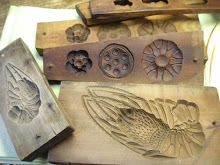 This is usually shaped into ornate, thumbnail-sized shapes in wooden molds where they become dry and stiff before being tapped out and arranged in pretty boxed collections, most often to accompany the somewhat bitter matcha tea in a tea ceremony. But there are larger versions to give as gifts or display as Buddhist altar offerings on holidays like today. I'm not a huge rakugan fan (they're too dry and sweet for my taste), so I passed on my friend's offer, but then I thought it might be cool to take a photo and post it at the top for you to see. The photos below show the usual miniature confections in pretty, seasonal shapes. 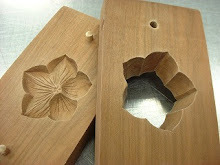 You can find a photo of some rakugan molds in the right column of the blog.